I'm primarily a quilter, but here and there, I like to switch things up with a quick, small, handmade project. This really keeps the creative juices flowing (especially when I'm stuck on a quilt or need inspiration or what have you). One of my favorite go-to projects has become pouches - most specifically, the Open Wide Zippered Pouch by Anna Graham of Noodlehead. The free tutorial is very thorough and creates a really professional finish. I've tried the pouch a few times in the past, but for whatever reason could not get the zipper right. This time, though, I did! For the record, zippers really aren't hard to install (REALLY, I PROMISE), and you don't need a special sewing machine foot to do it, either. This zipper is unique because of the way the pouch is supposed to open (check out the tutorial for a good picture). I gave myself a pat on the back (in my mind) when they all came out nearly perfect. If I'm going to make one pouch, I need to make a whole batch! Chain sewing is the best. At the beginning of the summer, there were several occasions that required small gifts. At this point, if I have a couple of hours to make something, I've pretty much given up shopping around blindly for a gift that the person might not even use (I have lots of thoughts about this crazy culture of buying gifts, but that's a post for another day). Plus, going through all the motions several times also improves my sewing. And I get pouches out of it. Win-win. 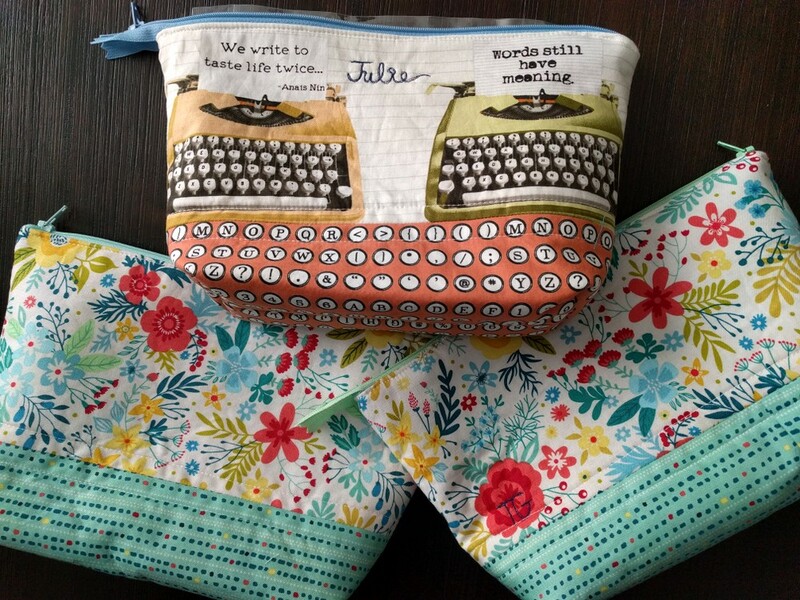 Check out the typewriters (from the Letterhead fabric line by Deborah Edwards)! Aren't they so cool? All the fabrics below were part of a fabric pack that Northcott Fabrics sent to me to play with, and they fit the bill perfectly. I love how customizable pouches are; I usually inscribe each one with initials or the recipient's name. They were a big hit! My friend Julie, for example, is a writer, so I had to use the typewriters and letters for her. Inside, I included her first sashiko stitching panel and all the necessary supplies, since she's already a fab cross-stitcher and wants to try more needlework. The other two flowery pouches, made for two friends, purposefully match. I like the summery vibes - this is the Chloe fabric line. Pouches are a great gift, and I'm sure it won't be long before I make another batch! I try to keep zippers on hand for that exact reason (lately, I've been collecting lace zippers for this purpose - have you seen those?). Full disclosure: Northcott Fabrics sent me fabrics to make with and give away. All opinions are honest and my own. Today, I'm giving away a half yard bundle of 3 Bohemian Vibe fabrics by Northcott Studio! Thank you to Northcott for offering up some fabrics for my readers to play with. This giveaway is open to anyone worldwide. Giveaway details: Runs from August 8 until August 15 at 12 am EST. Use the Rafflecopter above to enter - this helps me when tallying votes. Once you comment on the blog, please be advised that it will not appear right away (I have to approve comments due to insane amounts of spam). If you have ANY trouble, please email me and I will post the comment for you! Blogger has been really difficult lately. You can still comment and not be entered in the giveaway if you so desire (just don't click anything in the Rafflecopter). I will not be responding directly to all blog comments at this time due to volume and issues with Blogger (unfortunately). Good luck! I agree that pouches are a great, useful, fun and beautiful handmade gift. I agree that pouches are a wonderful small gift. I also like table runners and pot holders for gift giving. I make lots of different styles of all of those items, so no specific tutorials. I have seen the Noodlehead pouch tutorial and really must give it a try! Thanks for the inspiration. I also love the idea of making gifts instead of buying something for friends. I'll have to try this pattern. Normally, I just wing it on small bags. I have made a few pouches and love to give them as gifts. The Lazy Girl bags that use 1/2 of a zipper were a bit of a challenge to get the hang of, but actually were very clever. Love your bags and thanks for the giveaway! I follow you on Bloglovin and enjoy your posts! Adorable zipper cases! I like to make pencil cases - This is a tutorial I have used! love most anything handmade, but recently I received a mini quilt that I just treasure!. I just tried making my first pouch too! Oooh, I love those pouches and colorful fabrics! Yes, I've seen the lace zippers, but haven't indulged in buying any yet. I really need to! My favorite small gift to make is a personalized mug rug using my embroidery machine or a set of matching coasters. A set of pot holders are fun too and always well=received. For quilter friends, I like to make handwork wallets to hold needles, thread, scissors and thimble. For others, totes are a go-to gift from me. I like making pouches but it seems like I make a lot of pot holders these days. Your pouches tuned out very nice. I would love to win that beautiful fabric!! I love your pouches! My favorite small handmade gifts are pouches (like you) or table runners. My favorite small handmade gift is small coin zip bags. You can embellish more with them because you know they aren't going through the washing machine, and they're small enough so they get finished. I absolutely love all your cute little pouches. They are all so adorable. Thank you for the giveaway. Love these pouches. I would like to make larger ones without the zipper. Do you a good pattern? I enjoy making little pouches and looking for new patterns. Happy Creating. I think my favorite thing to make are table runners and/or placemats just because you can really use up scraps with them! I think I make more baby quilts but I want to start giving more quilty gifts to people as well. Pouches are nice because they can be filled with something personal for the recipient. Lately I've been making the weebrawbags, pattern by Laura Zuckerman. Pouches are always great for small gifts. 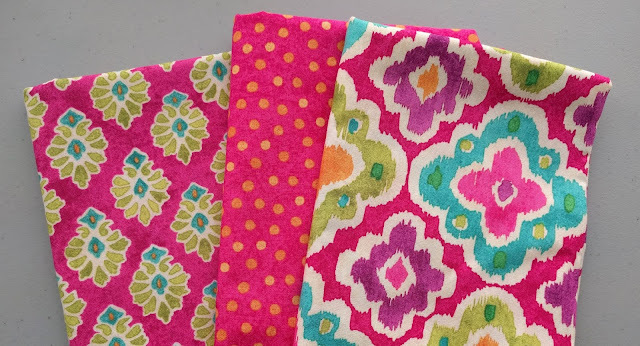 These fabrics are gorgeous - thanks for the giveaway. I love these pouches! I am afraid of zippers...so one of my favorite quilted small things are potholders : ) I have some zippers though, and am inspired by you to try it! Beautiful pouches! It's a great little pattern and welcome diversion. I always appreciate a handmade gift because of the time that goes into it. I love consumables too. Thanks for the giveaway. Cute pouches - great job! I love making pouches and pincushions as small gifts. for quilting friends i like making mini design boards (15X15 is a very handy size. the tutorial is on the Bee in My Bonnet blog site by Lori Holt. I love those pouches! They are great for all sorts of things. 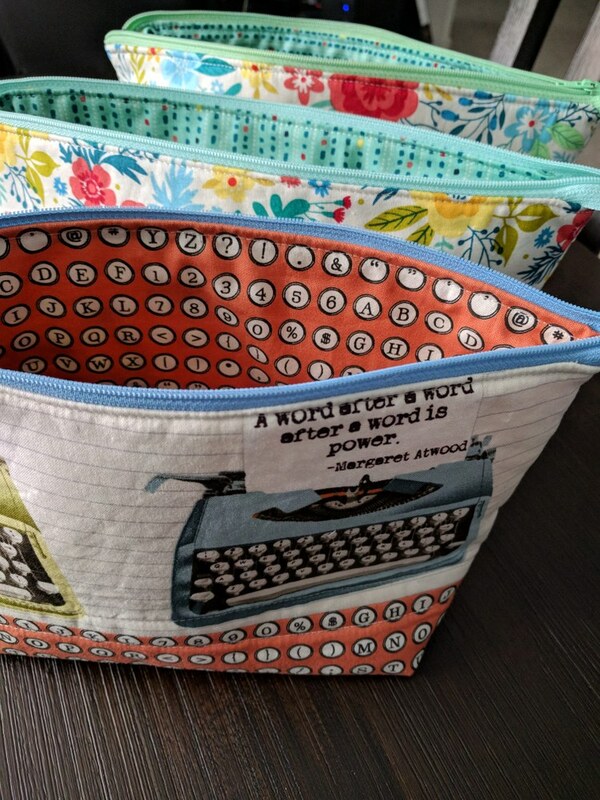 What is the fabric that you used with the quotes? It looks great with the typewriters. My daughters all have quilts and really don't need more than a couple so several years ago I started making table runners, placemats and centerpieces. they are a fun respite from working on a large complicated piece and are much appreciated. I'm planning on making a porch tonight for my latest knitting project! If it for quilty friends, I love making pincushions. For others, it is usually pot holders or a table runner. My go to small gift is a pouch. However, I also like to make covered books of various sizes. Sorry I don't have a tutorial for this. I also love to give zippered pouches. When invited out for dinner, I also like giving flourcloth towels with a trim sewed on. I used to make a small handmade ornament, wallhanging or bag for the ladies I work with. Then, many of the ladies left and there was an influx of men at work---they didn't appreciate my handmade things! I like to make simple tote bags for friends. Wow! Those are beautiful fabrics and would make some beautiful pouches. My favorite is a small bag made to hold my water bottle and some hand-sewing articles. Just the right size for me! I like making little baskets and potholders for gifts. These Fabrics would be fun to work with. Cute pouches! I'm a fan of pouch making, too -- especially making a bunch in one go. For me, the fun thing about pouch making is that I get to use fabric that might not otherwise be suited for a quilt. Got to put that stash to good use, you know?! BTW, for other quick gifts, I adore Fabric Mutt's Pixie Basket tutorial (http://fabricmutt.blogspot.com/2016/02/the-pixie-basket-tutorial.html)and Mama Love Quilts' Cubed Pin Cushion tutorial (http://mamalovequilts.com/2016/08/how-to-make-a-quick-and-easy-cubed-pincushion.html). To date, I've made 15 of the Pixie Baskets and 8 Cubed Pin Cushions. True story! I love cocktail napkins....no tutoriaal yet. I’ll put this on the lis! I love to make pouches for my grandchildren and fill them with goodies. Open Wide pouches were the first ones I gave as gifts. I add a tb with w key ring, so the recipient can attach a wrist strap or just use the ring as the handle. I make several different kinds of pouches - flat pouches are a great way to use up extra/practice patchwork blocks! Crafty Gemini has a tutorial for Carrot pouches that were a perfect gift for friends at my barn. I have also made the bowl holders (which are good for cold (ice cream!) bowls, as well as hot. They were a big hit. I recently saw a tutorial for them that uses charm squares that may be one of my Christmas patterns. Coffee sleeves and mug rugs are other ways to make gifts from scraps or leftover blocks. I like to make pouches, potholders, and coasters for small gifts. I also like to give fabric napkins, and I know I found a good tutorial on Purl Soho awhile back. I don't give away a lot of small gifts...tend to give away bigger things like quilts. I have made mini mini quilts for co workers and coasters and a few boxy pouches. I like to make potholders, but your pouches are soooo cute! Love the pouches! Always a great idea and can be so personalized. I love your zipper pouches. Thanks for sharing. I made small bag for my great niece to carry crayons & other small items she wants. I am in need of a few pouches myself. Thank you for the chance to win this bundle. I picked up a pattern for collapsible thread catchers a few years ago. They're quick to make and my friends have loved them. I've lost track of how many I've made, but I'm like you -- if I'm going to make one, I might as well make 5 and have them on hand! Linda S. via email: One of my favorite small gifts to make are scrappy pincushions. Just like making them- almost immediate satisfaction! I've tried a few pouches and still need to master the zipper! 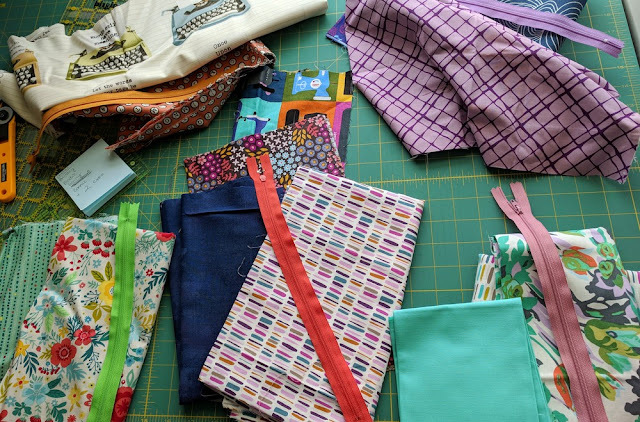 Karen of Tu-Na quilts, via email: I’ve been scared of sewing zippered pouches because of the zippers. But I just need to sit down and sew one. My favorite quick sew project is a bag without a zipper or small mug rugs. I’ve got a set to make to take to Germany in a couple of weeks and I just might have to try my hand at some zippered pouches too. 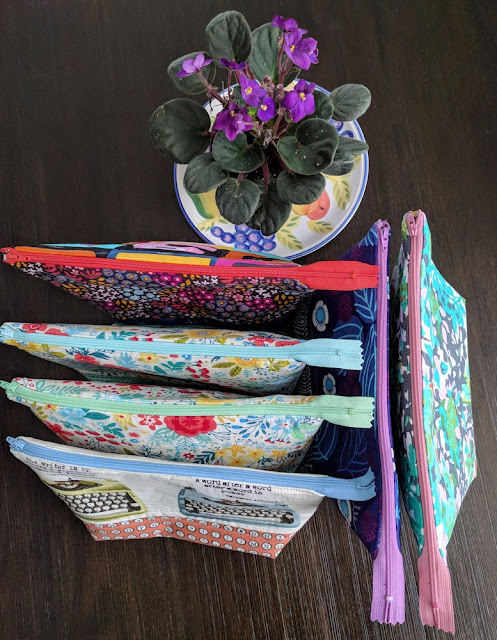 I have made a few open wide pouches for teacher gifts, I might change the dimensions slightly or use pieced fabric, but they are always appreciated. Pouches are the best! My purse is organized with them! The pouches are adorable and look easy! And the fabrics are bright and wonderful. my real favorite is actually a crocheted little "dubbie" [a square with an animal head attatched] for a baby or small child. but a small pillow or wall hanging with the childs name on it, quilted of course, comes a close second! Thank you so much for giving the opportunity worldwide! My favorite small gifts are always potholders! I Spy Pouches by Sara Lawson make great pouches for holiday candy or gift cards. I do love your typewriter pouch!!! Sadie B. via email: my favorite small gifts to make are small pouches and potholders! everyone cooks, and you can personalize them; superheroes seem to be a popular request. Thanks for the opportunity to enter. your pouches turned out great - i love the one with the typewriter keys; what a thoughtful way to personalize a gift, and i love how you used a lot of different fabrics in each pouch for visual variety and pleasure! Small pouches are my favorites, also. I believe hand made gift are more meaningful to the recipient. It shows them how important they are that you would take the time and effort to make something for them. Denise G via email: I enjoy reading your blog, and am interested in making one of these pouches. I will also make table runners. Shari D. via email: I wanted to say that I love sewing zippered pouches and that I can't wait to make one or 2 using this tutorial. I hope I can still me entered into the contest. I’ve been wanting to try making a zippered pouch but have been intimidated by installing a zipper. I think I will give this tutorial a try. Love the fabric, I’m drawn to brights. what fun you have gathering fabric and sewing up gifts, oh how lucky your friends are, sew I just might have to also start, have zippers sew luv all your fun fabrics, thanks again for inspirations and a nudge to get going and stitchen! Love the gifting idea and getting ahead for the holidays. Wonderful post. I made guest towels last year for friends. I drew out my hand and appliqued it onto the pre bought towel. Get the joke? It was a " hand " towel. I saw it somewhere and got the poster's permission to copy her idea. This year I want to draw the grand nieces and nephews hands and give them to their parents. Roberta via email: LOVE the zippered pouches with such possibilities to use up smaller pieces of fabric for outside and lining! Plan to make several for gifts for a party we'll be hosting in the fall! Also loved the colors you featured with the African violet against a hand-painted dish. Inspirational.. Thanks!